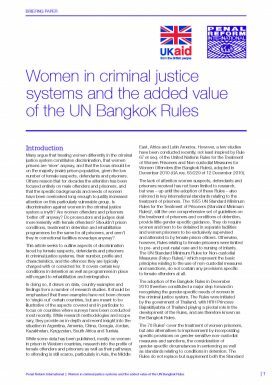 This new article by PRI’s Policy Director, Andrea Huber, seeks to outline aspects of discrimination faced by female suspects, defendants and prisoners in criminal justice systems, their number, profile and characteristics, and the offences they are typically charged with or convicted for. It covers certain key conditions in detention as well as programmes in place for rehabilitation and reintegration. It draws on data, country examples and findings from a number of recent research studies, in particular in Argentina, Armenia, China, Georgia, Jordan, Kazakhstan, Kyrgyzstan, South Africa and Tunisia.